Flexiloop handles can be applied to a flat bag (with base gusset) or to an SOS style polythene carrier bag as shown here. These are not usually manufactured in the UK due to the machinery not being available. 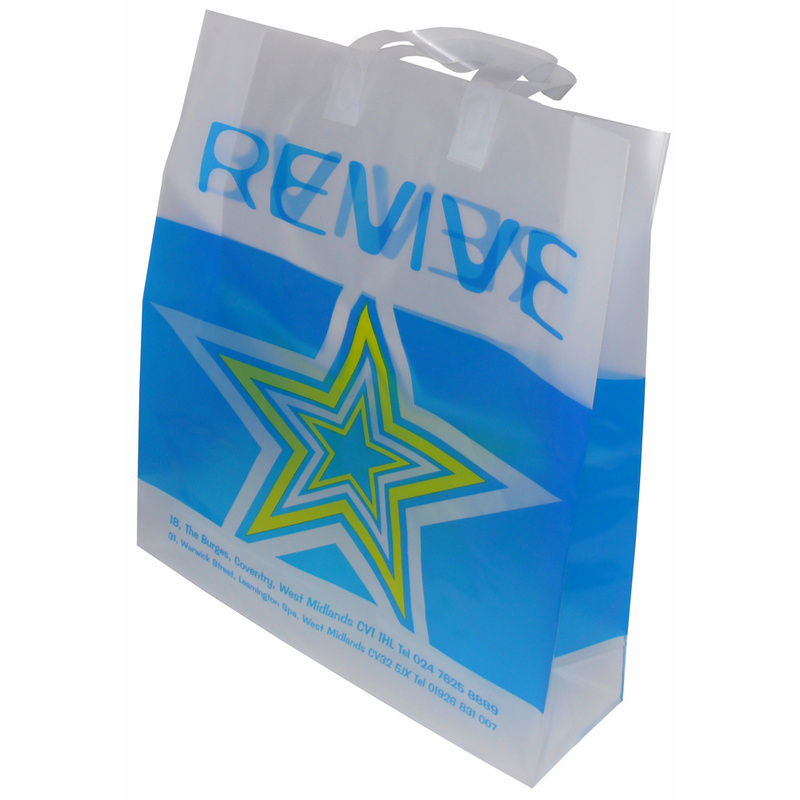 These bags are highly customisable and can be produced from HDPE or LDPE (High or Low density polythene) depending on requirements. HDPE is stronger but has a matt finish, where as LDPE is much more glossy but weaker for similar thickness material. LDPE is suitable if you require a clear polythene bag, where as HDPE results in a slightly frosted finish. The HDPE material shown within the bag here is specifically designed to be frosted. The bags can also be fitted shoulder length handles, rope handels or ribbon handles (eyelets required). For extra strength card reinforcement can be added to a turn over top to give the top of the bag a more rigid feel. Also, a card base can be added to give support and help keep the bags shape should heavier items be placed into the bag. HDPE Flexiloop bags can hold a massive amount of weight. Some have been proven to carry over 10kgs. printed 2 colours, all sides. Beckdale.co.uk arrange the production of bespoke side and base gusseted flexiloop bags. The Companys design team assist throughout, helping managers decide on tailored side and base gusseted flexiloop bags. To order choose by material or different styles of , please contact Beckdale via phone or email.